HARE & BONE is the creation of Sam Burnett, an award winning hair stylist and our Creative Director whose innovative designs have inspired international campaigns and global brands. As a result, HARE & BONE is an instinctive fashion-focused, style and trend conscious salon that is set apart by our creative session experience. Sam’s mission for HARE & BONE is simple: to provide every one of our clients with an exceptional salon experience, whilst leaving with hair they absolutely love! Housed in a comfortable and relaxed Fitzrovia space, our salon is rooted in British heritage with a modern aesthetic. So what makes us different? At Hare & Bone we are committed to progress, through the continuous education and development of our team, so they always bring cutting-edge and contemporary, yet wearable hair designs to every one of our clients. Honest and passionate about his craft, Sam has hand-picked a team of super talented stylists and colourists who are set to lead the way as the new faces of hair. This passion extends also to creating a real, welcoming salon experience. We have endeavoured comprehensively to think through every element of the salon visit from the moment you walk through the door. Customer experience is at the heart of everything we do and we continually strive to exceed clients’ expectations through our creative and technical excellence in cut and colour, our attention to detail and our focus on providing each client with a truly personalised experience. Inspired by a desire to create hair that works with the bone structure of the face, we spend time getting to really know each client in order to create a hairstyle that will truly complement you and your personal style. 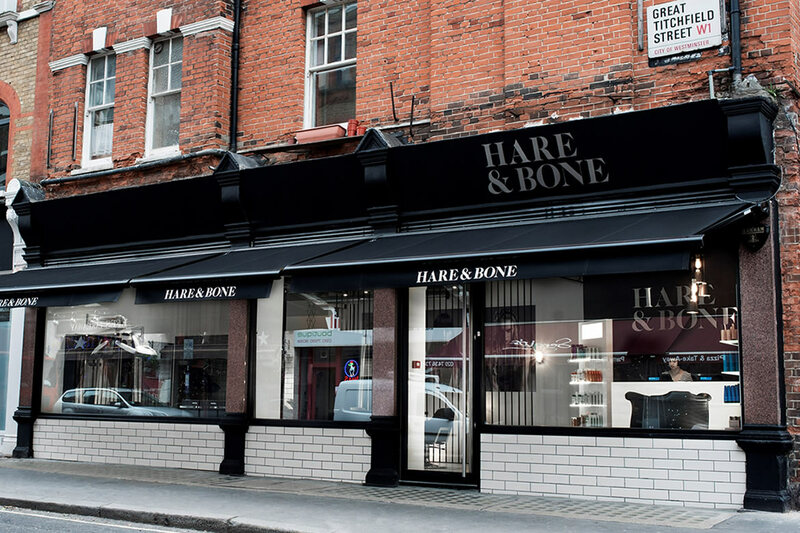 Hare & Bone’s clients span all age ranges and we are proud to boast a strong male as well as female clientele. Amelia is, quite frankly, the best. She has been doing my hair for around 9 months. I had a bleach drama a few years ago and was really nervous about dying my hair again but really wanted balayage, and she couldn’t have been more caring and helpful with it all. In the consultation she was honest with me about what we could and couldn’t do, and we left balayaging it until I next came so to make sure all the bleach was out of my hair. She really listens to what you want and puts her all into making it happen. I’m so happy with my hair every time, and she’s so lovely, it’s a joy to be sat in the chair for 4 hours!! I couldn’t recommend Amelia or Hare and Bone more highly! Loyal customer for life right here! Jamie is brilliant, one of the best in the industry. Lucky to be a client of his! Thanks to Jamie for listening to me and giving me the effortless wavy bob I was after-I love! Also for sharing your great styling tips .. defo going back and highly recommend. Really fantastic service, professional, friendly and my hair is great!!! I was really nervous but Amy took that all away due to her confidence and how she explained everything. She was full of useful information and I left so happy! Amazing hair cut and excellent service. Very happy! Lovely haircut with great attention to detail. Thank you Jade. This was my third visit to the salon. Usually my appointment takes 90 -120 minutes. For some reason this one took well over 2 hours. No explanation was given. I was pleased with the cut and colour but not with the time it took!! First time to the salon and Andrew was great! Perfect cut for my face shape and the atmosphere was friendly and relaxed. Would definitely recommend! I had my haircut and blow dry with Amy today. Amy always knows what I want and perfectly interprets it. Perfect cut for my face shape, perfect blow dry. I always leave the salon on a cloud! Came in drab. Came out fab! The salon atmosphere felt very friendly and professional. Jamie was an artist for my hair. It was my first time and since the moment I arrived the staff made me feel relaxed and welcome. Jose arrived almost immediately and took the time to help me to figure out what will be the best cut for me. I love it! Very friendly and professional. I highly recommend it. This was my first visit and I will be back! My stylist was Amy and she was great. She made sure to understand me and my hair before she got started. I am very pleased with the results. Amy had to do a colour match in a head with different colour highlights. We had a brief chat as to what it was required and got on with it, producing the desired outcome without much effort or explanation on my part. She offered me the massage chair and a nice head massage as she was rinsing my hair and she finished on time. I was very happy with the result and with Amy’s customer skills. Always the best stylist in town :) thank you! Ace haircut from Sam. A professional yet relaxed atmosphere. I arrived in a pumpkin and left in a crystal coach! I have been going to Earnie at H&B for over two years now. She has been amazing with understanding my style and giving her suggestions accordingly. All the other stylists and staff are very welcoming and give all their clients enough attention. Jamie (& Sam) have looked after me for nearing 20 years. Hare & Bone bring them together in my best and favourite experience so far. All the staff at the salon are fabulous, friendly and fun to be around. Keep up the good work.